The Britanys’ raw “I Don’t Know How to Be Alone” is a stark wake-up call about technological addiction and dependence. Not to sound like every concerned parent ever, but… maybe being on our phones 24/7 really isn’t all that good for us! Something feels lost in our generation; it’s like a good portion of us never fully developed our social skills because we were too busy developing relationships with our computers and later, our smartphones. For a technology that’s been touted as a connector with the ability to bring the whole wide world together, computers and smartphones seem to do equally as much separating and dividing. This is not meant to belittle younger generations, of which I am a member (and a pretty addicted technology user, might I add); rather, consider this a harsh, but accurate look in the mirror – a troubling observation of younger folks’ increasing dependence on technology, and inability to function at quite the same level as our predecessors. The Britanys’ raw “I Don’t Know How to Be Alone” is a stark wake-up call about technological addiction and dependence – a vibing and feelgood indie rock song with deep, dark truths. Atwood Magazine is proud to be premiering the music video for “I Don’t Know How To Be Alone,” The Britanys’ second single of 2018 (released in June). 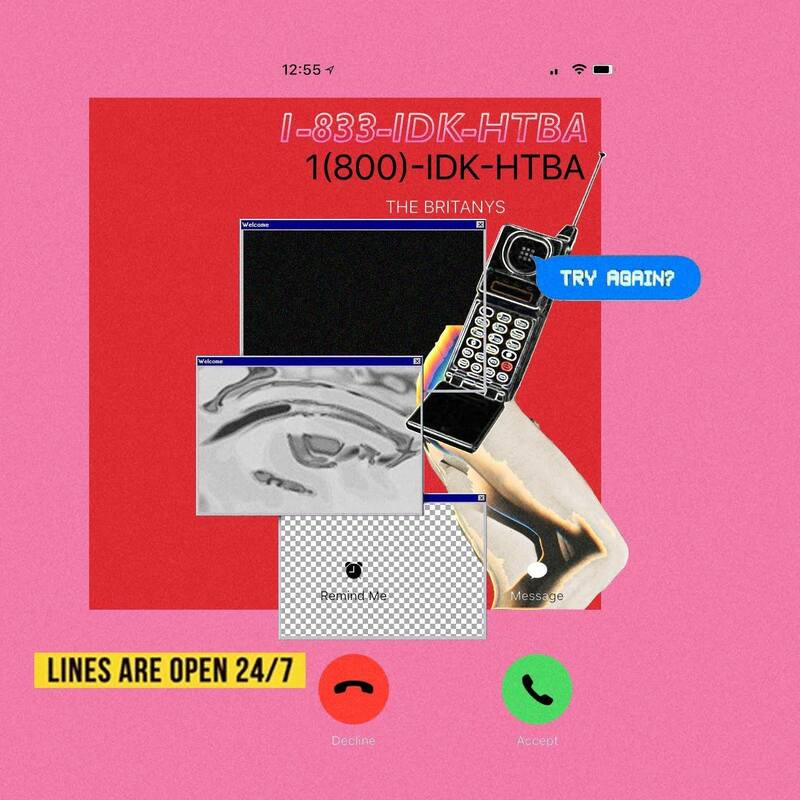 Shot and directed by Jimmy Giannopoulos, “I Don’t Know How to Be Alone” – stylized “1(833)IDK-HTBA” for the video – is as much an anthem for Millenials and members of Generation Z, as it is a message to them: One of solidarity, vulnerability, and understanding. “I Don’t Know How to Be Alone” is exactly what it sounds like: An admission; a cry into a dark void – or perhaps a friendly ear. The Brooklyn band – consisting of Lucas Long, Lucas Carpenter, Jake Williams, and Steele Kratt – are highly reminiscent of early The Strokes as they lament the damage technology has seemingly done to them, or put better, the damage they’ve done to themselves by overusing technology. Lucas Long bemoans his inability to communicate effectively anywhere but over the phone. Texting is no longer the alternative; it’s the preferred method of communication, easier than speaking to someone over the phone or directly. Worst of all is the overwhelming sense of loneliness that washes over when one isn’t attached to their device. “I don’t know how to be alone,” Long wails in the chorus, “That’s why I’m always on my phone.” Taken from The Britanys’ upcoming mixtape Can’t Stop Checking My Phone, “I Don’t Know How to Be Alone” epitomizes the young person experience – especially in urban metropolises, where folks live in such close proximity, yet are still greatly separated from one another. 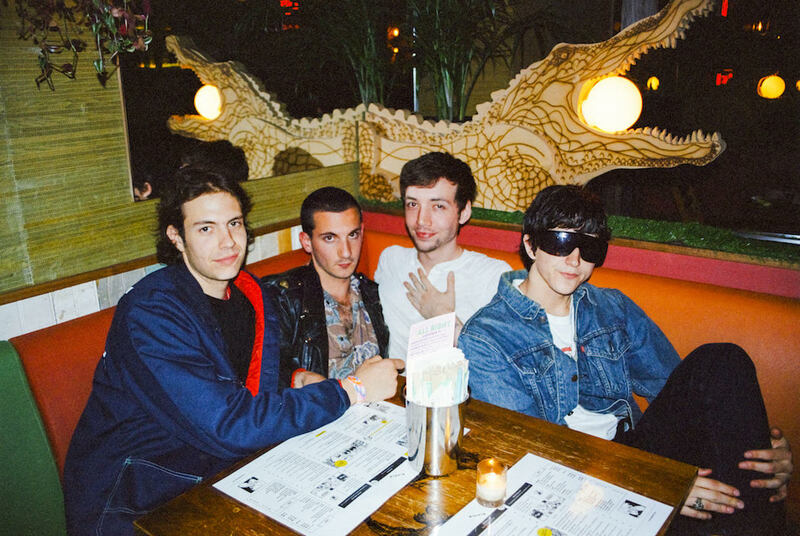 The band’s vertical music video goes so far as to make us feel like we’re watching them through a smartphone screen: We see the Brooklyn four-piece, who all live together in Bushwick, New York, hanging out and being young: One by one, each member makes an appearance on the thin strip of visible space, popping in for a glare or smile. You feel like you’re in on the bit – like they’re looking not at the camera, but at the person on the other side. They bring us into the fold, turning an otherwise faraway audience into a “fifth Britany,” so-to-speak. The band have also launched a ‘Britany’ “helpline” chat bot on their homepage that fans can interact with through text. “The goal is to help foster a community in an age of isolation,” the band explains. If you can’t tear everyone away from their phones, then you might as well set up services that can be there for them in times of need. The Britanys are doing their part in trying to bring everyone a little closer together. If you’re feeling lonely, consider calling 1-833-IDK-HTBA. Stream “I Don’t Know How to Be Alone” exclusively on Atwood Magazine!